Halloween is approaching! 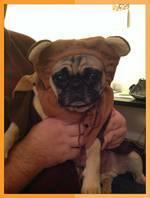 While it is a fun time for adults and children alike, Halloween can be very stressful for our furry friends. Here are some simple tips for keeping your pet safe and happy during this Halloween season. Keep your pet visible. If you plan on taking your dog trick-or-treating with you, make sure it is easily visible to cars and people when it is dark outside. You can do this by having your dog wear a reflective collar or vest. Keep chocolate and candy out of reach. Chocolate can be very toxic to dogs if eaten. Be sure that none of your treats are left in reach of your pet. Even candy can cause a severe upset stomach if enough is eaten by your pet. Use comfortable costumes for your pet. If you plan on dressing up your dog or cat, make sure it is comfortable in its costume. If it is really stressed out about wearing a costume, don’t force it to, as it may end up hurting itself trying to escape. Never leave your pet in a costume unsupervised and avoid costumes with loose and dangling parts that your pet may tear off and swallow. Have a safe place available. Constant doorbell ringing and visitors (especially visitors in costume) can be very scary and stressful for some pets. It is best to keep your pet in a crate or a quiet room away from where all the excitement is happening. Consider a Thundershirt® or speak with your veterinarian about medications if your pet is extremely stressed by these issues and might hurt itself. Your dog should be kept away from the door at all times to make sure it doesn’t run out or harm any of the trick-or-treaters. Keep your cat indoors. Your cat may not be used to the extra people and cars outside and this can present a danger if it gets scared of something. It may also be too fearful to come home if people are constantly coming up to the house. Furthermore, black cats are often subjected to cruel treatments around Halloween, so it is in their best interest to keep them inside. 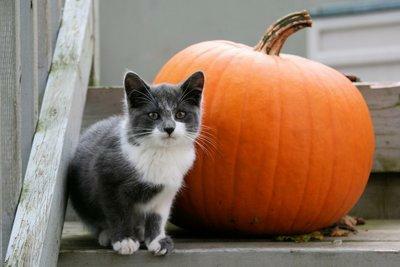 We at Coventry Animal Hospital hope that you and your furry friends have a fun and safe Halloween!